Two great BCS Bowl matchups yesterday. #5 Oregon edged out #10 Wisconsin 45-38 and #3 Oklahoma State amazingly figured out how to kick a field goal through the uprights and beat #4 Stanford 41-38 in overtime. First off, Nike never fails to impress by putting out incredible uniforms game after game for Oregon. Oregon sported shiny numbers and mirrored helmets, both of which matched pretty well with the trophy thier program earned from its first Rose Bowl win in the last 95 years. Their game was highlighted by monster runs from speedster De’Anthony Thomas, and three passing touchdowns from Darren Thomas. Despite 621 yards of total offense from Oregon, Wisconsin had a solid chance to win the game in its final minutes. After Jared Abbrederis caught a 29 yard pass from Russell Wilson, Oregon forced a fumble to recover the ball at their own 27. Wisconsin got the ball back and charged 62 yards downfield to Oregons 25 yard line, where they failed to spike the ball before the clock ran out, ending the game. As if the Rose Bowl wasn’t chaotic enough, the Fiesta Bowl proved even better for those who stayed up to watch it. It was two great college teams, with two of the best NFL prospects on the field. Wide Reciever Justin Blackmon of Oklahoma State came up big everytime his team needed a play and ended the game 8 receptions, 186 yards, and 3 touchdowns. On the other side, consensus future number 1 draft pick Andrew Luck, quarterback of Stanford, completed 27-31 passes for 347 yards and consistently put his team in a posistion to win the game. 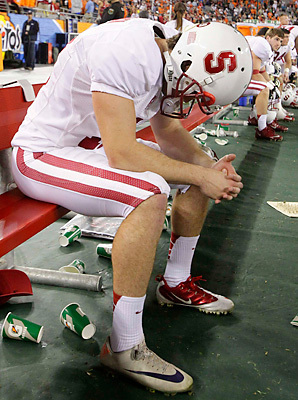 Unfortunately for Stanford, the game came down to their redshirt freshman kicker Jordan Williamson. The kid just didn’t have it in him. After Oklahoma State called a timeout to ice him before a potential game winning 35 yard chip shot, the entire audience could clearly see he was going to blow it. It was a storybook choke for Oklahoma State, the kicker tried to kill the ball and hooked the ball way left. Overtime went almost as expected after that. Stanford went first and after a few runs, a false start and a short pass (which I thought was horrible playcall- 2nd and 10 you need to put the game in the hands of Luck, who went 5-5 in the final drive of the 4th quarter), Williamson missed a 43 yard field goal to the left. (To Williamson’s defense, the second snap was not the best and the holder left the laces in, which is very distracting and harder to hit for a kicker.) Oklahoma State settled for a chipshot 22 yarder for their kicker and won the Fiesta Bowl. Unless LSU beats Alabama and ends the season with an undefeated record, there once again will be the question of whether or not there should be a playoff for Division I football. Although I think LSU is clearly the best team in college football this year, I think all four of these teams could have contended with Alabama and LSU and made a playoff very interesting. This entry was posted in College and tagged andrew luck, jordan williamson, justin blackmon, Oklahoma state Football, Oregon ducks, rose bowl, stanford cardinals, tositos fiesta bowl, wisconsin badgers by TOB$. Bookmark the permalink.